Evaluation of chronic aortopathies requires repeated follow-up imaging studies to assess stability. MRI/MRA routinely has been used as the imaging modality of choice for its multiple advantages over competing modalities. However, recently there is heightened concern over gadolinium-enhanced MRA in patients with significant renal insufficiency as a result of nephrogenic systemic fibrosis (NSF). 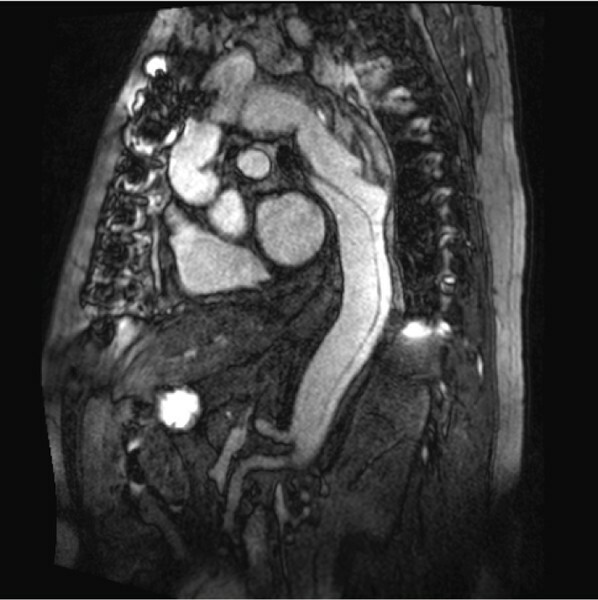 Development of a robust non-gadolinium enhanced MRI/MRA technique is needed for evaluation of aortopathies, particularly in patients with renal insufficiency. A robust 3D SSFP non-gadolinium enhanced MRA technique is equivalent or superior to traditional 3D gadolinium enhanced MRA. We prospectively evaluated 26 consecutive patients (21 men, 5 women; mean age 51 years) referred for evaluation of aortopathies, all of whom had normal renal function. Patients were referred for evaluation of aneurysms (n = 18), dissection (n = 2), graft integrity (n = 2), and coarctation (n = 4). All patients underwent MRI on a 1.5 Tesla scanner (Avanto, Siemens Medical Solutions), which included both 3D gadolinium-enhanced (Gad) and non-gadolinium enhanced (nonGad) MRA of the aorta. NonGad MRA images were acquired in a sagittal orientation using an ECG-triggered, fat saturated, T2-prepared, segmented 3D SSFP technique. Gad MRA images were acquired using a non-triggered acquisition which is the standard at our institution, following 20 cc gadolinium-DTPA injection (Magnevist, Schering). The matrix size was similar for both techniques (1.4 × 1.4 × 1.5 mm3). Each MRA sequence covered the proximal aortic arch branch vessels down to the level of renal arteries. Two physicians with dedicated cardiovascular MRI training performed quantitative and qualitative analysis at five pre-determined anatomic locations (aortic root, mid ascending thoracic aorta, aortic arch, proximal descending thoracic aorta, and diaphragmatic hiatus) for both MRA techniques. For qualitative analysis, a point scale (1 to 5, 1 = nondiagnostic/uninterpretable, 5 = diagnostic quality/no artifacts) was used for presence or absence of artifacts that limit confidence in formulating the diagnosis or making measurements at predetermined anatomic locations. A sub-analysis was performed on patients with prior median sternotomies (n = 7). Table 1. Qualitative assessment scores for 3D MRA techniques. There was no significant inter-observer variability for the quantitative and qualitative analyses of the MRI/MRAs. For both physicians, the qualitative point scores of the aortic root and ascending thoracic aorta were consistently higher for the nonGad technique compared to the gad MRA (p < 0.01). Even for patients with prior median sternotomy, the difference remained statistically significant in favor of nonGad MRA (p < 0.05). 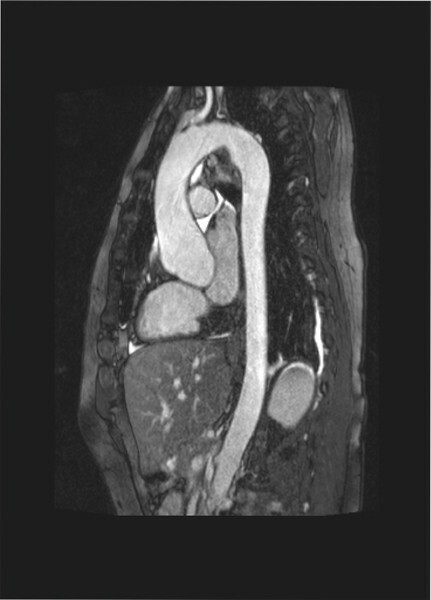 There was no significant difference between the two MRA techniques for evaluation of the aortic arch, descending thoracic aorta, and abdominal aorta. The mean total scan time was 10.8 minutes for nonGad MRA and 5.8 minutes for Gad MRA. Figures 1 and 2. Non-gadolinium enhanced MRA allows for comprehensive evaluation of aortopathies with a single sequence. Compared to Gad MRA, nonGad MRA is an equivalent technique for quantitative measurement and a superior technique for qualitative evaluation of the aortic root and ascending thoracic aorta. Thorough and accurate evaluations of the aortic root and ascending thoracic aorta (extent of dissection, involvement of coronary arteries, and aortic valve leaflets) are critical and affect clinical management (surgical vs medical intervention). Qualitative evaluation was particularly improved for the aortic root and ascending segment as a result of ECG-gating inherent within the nonGad sequence minimizing motion artifacts to which gadolinium-enhanced images were prone. Theoretically, sternal wires pose problems due to susceptibility artifacts; however, our study results indicate the superiority of nonGad MRA technique even in patients with sternal wires. The 3D nonGad sequence alleviates concerns about NSF and may be a preferred sequence for patients with renal insufficiency and clinical concern for aortopathies. In summary, 3D non-gadolinium enhanced MRA is a robust technique that provides equivalent or superior information on aortopathies compared to standard gadolinium enhanced MRA.